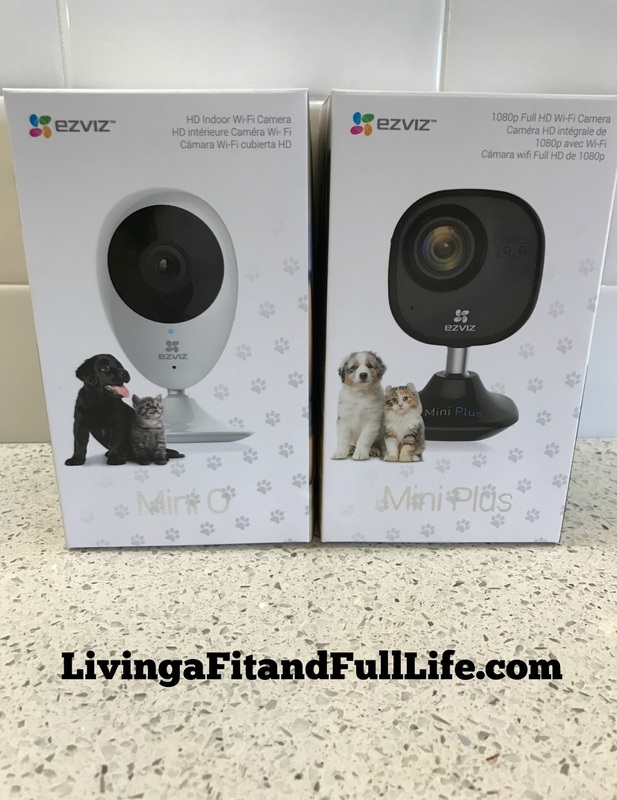 Living a Fit and Full Life: Stay on Top of Your Home's Security with EZVIZ's Mini Plus & Mini O Wi-Fi Home Video Monitoring Security Cameras! + Giveaway! 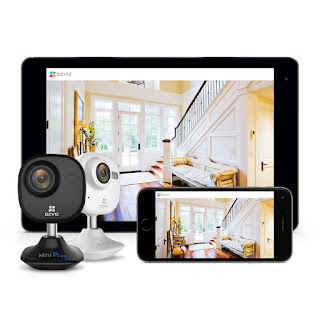 Stay on Top of Your Home's Security with EZVIZ's Mini Plus & Mini O Wi-Fi Home Video Monitoring Security Cameras! + Giveaway! Mini O makes it easy to keep an eye on what’s happening in any room – its magnetic base quickly clamps to any magnetic surface for easy set up. Once placed, you can adjust where the camera is aiming by moving it with your hand. with IFTTT capability for connecting to IoT smart devices and voice control with Amazon Echo. Always adding new features and functionality with one-click updates. through the EZVIZ app, which lets you see all of your EZVIZ cameras in one place. Secure and encrypted using multilayer security and end-to-end video encryption. and 111° viewing angle for clear HD video when it gets dark. Receive motion detection alerts through the EZVIZ app on your smartphone or tablet. to choose from. A cloud storage option is available, and includes a free one-month trial with 7-day playback. For storage locally, camera accepts up to a 128GB micro SD card for storage beyond the cloud. Mini Plus is the perfect indoor connected camera solution for any home. Equipped with 1080p video, a wider viewing angle, crisp and clear images, and 2-way audio, this camera gives you eyes into your home—day or night. through the EZVIZ app, which lets you see all of your EZVIZ cameras in one place. Receive motion alerts on your mobile devices when movement is detected. while away using the built-in speaker and mic. and wide-angle 135° view for clearer video and sharper details over a wider area. Improved night vision sensor automatically switches for clearer HD video when it’s dark. to choose from. For storage locally, camera accepts up to a 128GB micro SD card for storage beyond the cloud. With EZVIZ's Wi-Fi Video Security Camera you can stay on top of your home's security and monitor Fido while away! EZVIZ's Mini O 720p HD Wi-Fi Home Video Monitoring Security Camera is a terrific Home Video Monitoring Security Camera! I absolutely love how easy it is to set up and thanks to its magnetic base it quickly clamps to any magnetic surface. Once placed, you can adjust where the camera is by aiming and moving it with your hand. After you have adjusted it to where you want it you can log into the EZVIZ app and view your home from anywhere at anytime. It also has night vision so you can even view a dark room at night and with it's built-in speaker and mic you can listen in and talk while away. The picture looks terrific and I'm pretty impressed with the night vision. The EZVIZ Mini Plus HD 1080p Wi-Fi Video Security Camera is also a terrific Wi-Fi Video Security Camera! With the EZVIZ Mini Plus HD 1080p Wi-Fi Video Security Camera you get 1080p video, a wider viewing angle, crisp and clear images, and 2-way audio so you can see and hear while away from home. I love that I can receive motion alerts on my mobile devices when movement is detected so I'll know instantly if an intruder is in the home. The night vision looks amazing and I love how clear the image is! I also love how easy the app is to use, even with multiple cameras! 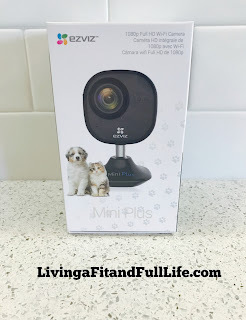 The EZVIZ Mini Plus HD 1080p Wi-Fi Video Security Camera is perfect for just about any room and I absolutely love that I can stay on top of my home's security while away. My favorite feature of both of these security camera is the listen in and talk feature. We have 2 cats that love to act up when left alone and I can't even tell you how many times I've caught them in the act thanks to these EZVIZ security cameras. I'm able to see them behaving naughty and tell them to stop with the security cameras. They immediately stop and look around and then begin roaming the house looking for me. These security cameras are perfect for pet owners who want to keep a watchful eye on their pets while away. The EZVIZ Mini Plus HD 1080p Wi-Fi Video Security Camera and Mini O 720p HD Wi-Fi Home Video Monitoring Security Cameras are phenomenal security cameras and I highly recommend them!